It was such a good refresher of remembering truths, being validated, and just having that counseling environment that is so open to hashing it all out. I was reminded of certain tendencies I have, and certain things that trigger those tendencies. And it just helped me remember that I'm not crazy, and there is a reason why I do the things I do, think the things I think, and feel the things I feel. I am not operating from an unfixable place, I'm operating the best I can in a broken world. Parenting is broken. Being a kid is broken. Loving others is broken. The government is broken. We are all broken, and I think that a lot of us are trying everything to do the best we can. Thank goodness it's not about what we can do or be (Romans 3:25). It's what God can do and who God can be. This morning Lisa sent me a text that said this: "Prayerfully chew on this: I will give thee the treasures of darkness. Isaiah 45:3". I really love whenever other people send me scripture with specific instructions or insight. It makes me feel like it's not all up to me (even though it really isn't) to process and dissect scripture. So I was excited to sit down and see what this text was all about, because you know any scripture with the term "darkness" in it is bound to make you joyful, right? the God of Israel, the one who calls you by name." At the beginning of chapter 45, we are notified that the Lord is talking to Cyrus, the Lord's Chosen One (also referred to later as His anointed one). 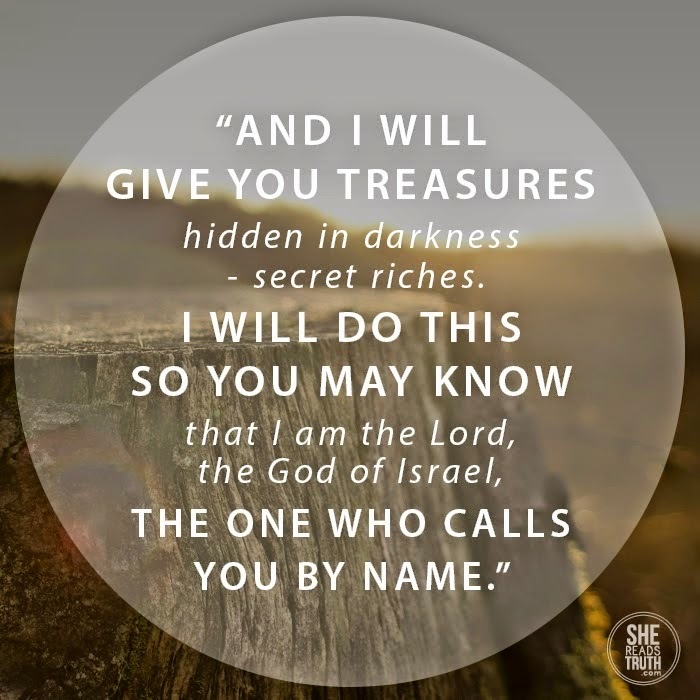 God says that He will give him treasures hidden in the darkness. Secret riches. And the reason He's doing it that way (hiding them in darkness) is so that Cyrus will know God is the Lord and that God calls Cyrus by name. That's just a basic observation from verses 1-3. From there, I move on to interpretation (If you are wondering, I use this method to analyze scripture: Observe, Interpret, Apply, Pray). To me, I get the sense that these treasure's hidden in darkness can only be found that way. They can only be discovered and enjoyed through the darkness. And the Lord chose this path for...his anointed one. The Lord's CHOSEN ONE. This wasn't a method that God used for someone that he wanted to teach a lesson to, or someone who he is disappointed in. No! He chooses this path for the one He loves deeply. I know about secret riches hidden in darkness. I've BEEN there. I think I've lived there for the past few years, as has been well documented on this blog. And so all that I can see, SCREAMING at me from this text is this: YOU are his anointed one! God chose you and he calls you by name! Yes, you, Bethany! You who struggles with belief, with doubt, with trust, with worry. It's you. You are His anointed one, the one He loves deeply. Thank you Lord for loving me so deeply that you would show me treasures hidden in darkness. I know that you are the Lord and you call me by name. It is a privilege to suffer in the dark if it means I will know who you are more. I am your anointed one!